Dr. Bishakh Bhattacharya is Professor, Department of Mechanical Engineering at the Indian Institute of Technology Kanpur (IIT Kanpur), India. 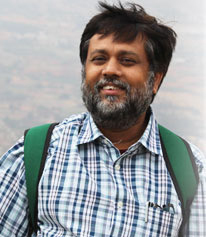 He is the former Head of the Design Programme from 2011-2013. He is currently heading the Cognitive Science programme and coordinating the Space Technology Cell of the Institute. He was a visiting professor at the University of Sheffield, where he carried out research on Structural Health Monitoring of Complex Autonomous Systems in collaboration with Prof. K. Visakan, Department of Automatic Control and Systems Engineering. He was also Visiting Professor to IPS-Waseda University, Japan and jointly developed a series of Pipe Health Monitoring robots with Prof. Harutoshi Ogai. As DST-JSPS recipient, he is working in collaboration with Prof. Hiroaki Wagatsuma of Kyushu Institute of Technology, Japan on Child Robot Interaction study. He is active in creating Web and Video based course materials for India’s National Program on Technology Enhanced Learning (NPTEL) initiative.